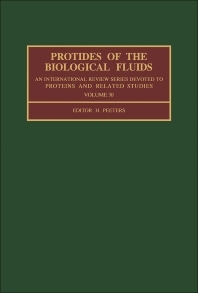 Protides of the Biological Fluids: Proceedings of the 30th Colloquium, 1982 is a collection of manuscripts presented at the 30th Colloquium, held in Brussels, Belgium in 1982. This text is organized into three sections encompassing 160 chapters. The first section highlights the mechanisms of the normal and abnormal mental function through evaluation of neuroproteins or the so-called “think-proteins”. This section describes the manifestations, clinical features, diagnosis, and therapeutic options of nervous system diseases. The second section tackles monoclonal proteins as a reagent to detect antigens. This section deals with the significant progress in cancer therapy and the binding of cytotoxic drugs to monoclonal antibodies. The third section considers the potential of isodalt electrophoresis and high-pressure liquid chromatography, with particular emphasis on their application to protein analysis in biological fluids. This book will be of great value to biochemists, clinical chemists, and clinicians.